More bloggers and shopaholics seem to be contemplating a shopping sabbatical or even an outright ban these days. The Clothes Horse and Emily of Vulgar Moon tried shopping bans as a means of motivating them to read some heavy literary works. Most recently, Arielle of Hautest Style asked her readers what they thought of her giving up shopping to save for a car. People have their own reasons for starting shopping bans, whether it's because they want to save for a big-ticket purchase or a trip, motivate themselves to achieve a goal, or are trying to curb some bad consumption habits. Indeed, with today's worsening economy, we may see more belt-tightening and less shopping in the very near future. I myself am now in month #4 of my own shopping sabbatical. If you're contemplating a ban/sabbatical, here are some things to consider beforehand and some tips to help you make it through. This is just based on my experience and what worked for me. Be realistic and specific when you set goals for yourself. I said to myself right from the beginning that my shopping sabbatical would include clothes, shoes, and accessories, and it would last 5 months. However, I didn't include toiletries and cosmetics, and this turned out to be a sneaky little loophole that has kept me sane. In the last 13 weeks, I've bought a new makeup case, makeup brushes, a pumice stone, nail polish, perfume, etc. When I add up the numbers in my head, what I've spent on makeup-y stuff is pretty high all things considered, but what I've spent in the last 3.5 months is still only half of what I'd typically spend on clothes and accessories in a single month. Substitute shopping habits with new ones. 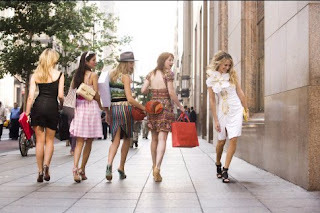 Is shopping a way of passing time when you're bored? A bonding activity with friends? An indoors pasttime for rainy weekends? Look at when and how you shop, and develop new habits as substitutes. If you shop when you're bored, find a hobby or apply for a volunteer position to occupy your time. If you shop to bond with friends, make plans to try a new restaurant or see a movie instead. Go to the library and look for a book to read on a rainy afternoon. Avoid going into stores. Stores and shopping districts are a major source of temptation. Just stay away. Why torture yourself looking at things you know you can't buy? Make a mental list of things you would like to buy when your sabbatical's over. It seems counter-intuitive, but I've been doing this for a while now and it does help. If after 5 months, you still want the item you initially craved, it's going to be a well thought-out purchase rather than an impulsive one. Also, waiting to shop forces you to do research. For example, one of the items on my list is a couple of good-quality investment cashmere sweaters, so I've been looking up cashmere-buying and garment care tips online. Having strict, non-enabler friends helps. If I'm with a girlfriend who's shopping and I'm a bit too interested in an item, she'll bring me down to earth quickly with a major guilt trip. Are you contemplating a shopping ban? Do you have any tips on starting and sticking to a shopping sabbatical? Ha-ha, shopping bans are so "in" right now! I know my shopping is a way to escape the dearth I am located in. I'm isolated and I don't have a car, but I want adventure and shopping online keeps me occupied. I spend far less when I'm busy and doing more things. I have a very specific shopping mood which makes me want to do nothing but poke around second hand shops for hours, and ignoring it is pretty hard! I find setting goals to be the most helpful thing when I try to stop buying things for a while. Telling myself I'd read three books before I bought anything else made me feel much more productive than just saying "four months without shopping!" Next time I think I'll make myself finish three paintings before going shopping again. I think the ban I've been contemplating has more to do with wanting to shop less wastefully (ie: throwaway and/or cheap clothes) and be more conscientious in general. It's less a money thing for me --and given how busy I've been, less to do with bad habits. But when I do shop, I just want to be more thoughtful. These are great tips and I'll be sure to keep them in mind for when I do follow thru on this. Hey! Those are good tips, and I'm proud of how you've kept to your goal! Only a few more weeks to go ;) Sorry but I'll have to leave your meme until I get back from Asia! I'll bring you back something cute to make up haha. good for you keeping it up so long. I'm on month 2 and you're motivating me to keep on going. I like your #4 point a lot. I tend to buy things that are great for one outfit but never really work with anything else simply because I bought it off impulse but I've been making a list now of things that will actually add something to my wardrobe. Can't wait til the shopping bans over tho! i have to give you HUGE PROPS for even thinking of going on a shopping ban. you cleary have GREAT SELF restraint that we can only DREAM of! !